I moved to The Woodlands in 2016. I was born to a family of musicians, and started playing violin at the age of 4. I studied at the Shanghai Conservatory of Music, majoring in violin performance. I was a member of the Shanghai Youth Symphony. I am currently a member of The Woodlands Youth Symphony and The Woodlands Symphony Orchestra, playing first violin. 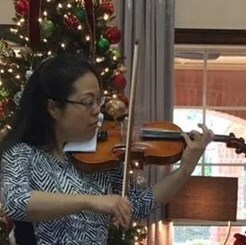 I have been teaching violin and piano lessons privately for over than 15 years. I teach all ages and ability levels and I have had a lot experience teaching younger students. Request Lessons with Zhenyun today!